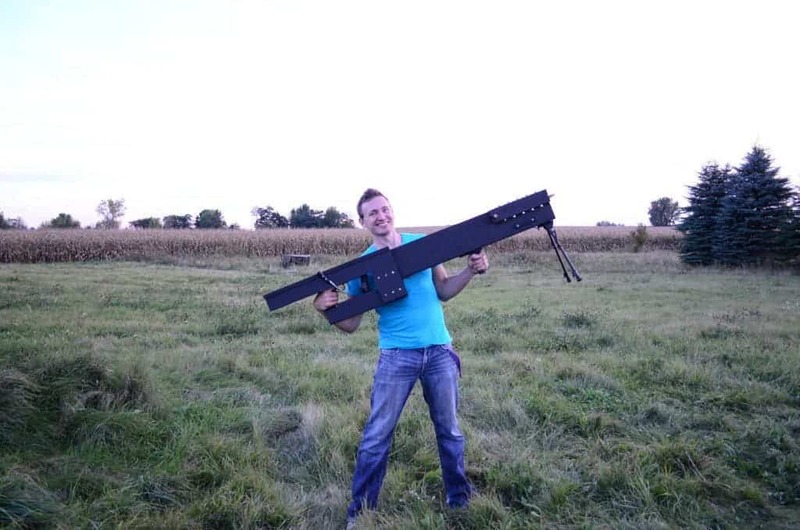 YouTuber Ziggy Zee prides himself with building the most powerful mobile electromagnetic railgun ever made by a non-gov. Just look at that thing. I’m scared at it is, but wait until you hear what it can do. According to his post on imgur, the 250 pound device employs 56, 400-volt capacitors. The combined capacitor discharge is enough to drive the aluminium projectiles with a whooping 27,000 joules of force. Dr. Evil Zee reports that he has conducted around a dozen tests already. The first runs turned out great, although these were poorly equipped to deal with the extreme magnetic forces. In the image below, you can see a projectile hitting a ballistic gel. I am providing information on how I created this project, but I cannot recommend anyone to try this, EVER. High voltage capacitors are extremely dangerous. High speed projectiles are dangerous. 9-volts are dangerous. Nothing in this project can be made absolutely safe.